I purchased this ring from the Charles and Colvard website a few years back but I never wear this ring much anymore so hopefully it can find a new home. This 3 stone style ring has a 9x7mm Oval moissanite stone in the center flanked by 3.5mm Square Brilliant moissanite stones. There are 1.3mm round brilliant moissanite stones on each side of the shank. The shank has wheat detailing with milgrain. It is very pretty and has that vintage look. The center Oval is the equivalent of a 2 carat Oval diamond. This ring is from the Forever Classic line and the stones do show some overall very light warmth to them outside but indoors they face up white. The ring is a size 8 and is Platinum Plated Sterling Silver. It can be resized within reason. 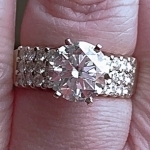 Just ask your jeweler to Rhodium plate the sizing area when he is finished resizing the ring. Charles & Colvard Certificate of Authenticity Warranty Card included. Hallmarked inside of shank 925, C&C, MOI. Video was taken on a cloudy day outdoors. The stones sparkle like crazy in Sunlight and LED lighting!